1. The look. Without a doubt the biggest reason to use decorative mailboxes is simply to create the perfect look. Decorative mailboxes range from traditional to modern styles, built of the highest quality materials and always made to stand out. They come in a wide variety of metal finishes with decorative elements including the address numbers/name letters, the posts, the boxes themselves and the fine details. Decorative mailboxes are available for single residences, duplexes, and apartments or office buildings with dozens of slots. The point with all of these choices is to give a mailbox that does more than just hold the mail—it adds to the overall look of a high class operation and adds to curb appeal. The mailbox is one of the first things you see as you approach, and investing in a nice one is worthwhile. 2. To make your place easier to find. How much does your home or office stand out from the others around it? How clear and visible are the address numbers? A decorative mailbox can solve both these problems. Decorative mailboxes always stand out and can make a home easier to find or a business more noticeable. Many feature large, tasteful address numbers or separate, matching address plaques that can be mounted on the door or wall. People will definitely spot you. 3. To match the surroundings. What do you do if your business is in a historic neighborhood? What if your home used to have a beautiful vintage mailbox, that’s no longer usable? What if you simply want to match your mailbox to a classic aesthetic or to area streetlamps and benches? While not all decorative mailboxes are in antique styles, many are and they allow you to put a brand new, secure mailbox in an area that features historic elements. You will match your surroundings and uphold the image you want while still getting a great modern mailbox. 4. Quality. Decorative mailboxes are generally high end mailboxes made to last. The locks and doors are secure, the entire mailbox is welded to be water-resistant, and the finish will outlast the cheap paintjobs of big box store mailboxes. 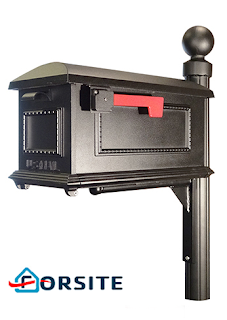 A high quality mailbox will last longer without the problems of fading, rust, leaking or water damage that lower quality mailboxes will experience. What kind of mailbox style are you looking for?